If you're tired of using the same C# programming tools, this compilation should give you a better idea of what is out there. Here, we’ve gathered together the first half of our list of the biggest players in the C# development space. Stay tuned for part 2 where we’ll continue this list. C# is a widely used programming language in enterprises, especially those that are heavily Microsoft-dependent. If you build apps using C#, you most likely use Visual Studio and have explored some of its extensions to supercharge your development. However, this list of tools might just change the way you write C# code for good. Visual Studio Code is the most popular code editor for C# development. You can use Visual Studio Code with the C# extension for powerful editing, plus full support for C# IntelliSense and debugging. Excellent auto-complete with context-aware suggestions. Built-in Git integration for better version control. Huge list of extensions to further enhance the platform. Developed by Xamarin, MonoDevelop has many of the similar features as VS Code and is also cross-platform. With MonoDevelop, you can quickly write desktop and web applications on Windows, Linux, and Mac OS X. Standard features like code completion and debugging. Also ships with Unity, a game engine, which enables advanced C# programming for apps like video games. Code completion support for C#. Code templates and code folding. A free, open source IDE for C#, VB.net, and Boo projects, #develop (SharpDevelop) is a lightweight alternative to VS Code. The usual features offered by Visual Studio including code editing, compiling, and debugging. A few advanced features include context actions and background syntax check. From the comprehensive Jet Brains suite of products, Rider is a cross-platform .NET IDE that’s based on the IntelliJ platform and ReSharper. Integrates seamlessly with other JetBrains products. Support for the Unity game engine. Supports both .NET Framework and .NET Core. 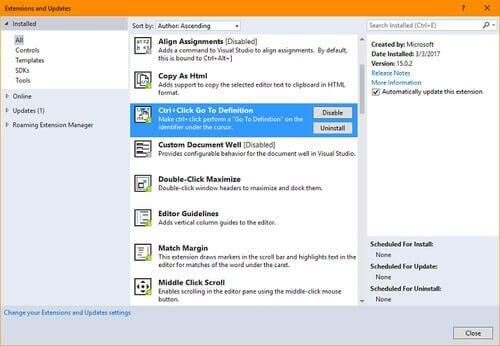 Provided by Microsoft, this is a great extension to quicken development with Visual Studio. A productivity extension that simplifies coding with the popular jQuery framework, jQuery Code Snippets offers more than 130 snippets for Visual Studio 2012, 2013, 2015, and 2017. Support for all versions of Visual Studio. Great for novice jQuery developers who can learn the ropes using this extension. CodeMaid is an open-source VS extension that can help you cleanup and simplify code in a variety of supported languages in addition to C#. Get rid of unnecessary characters like white space from your code. Navigate code easily using a tree view hierarchy. Make your C# code easier to read and fix common errors with Refactoring Essentials, a VS extension with built-in code converters for C# and VB. Fix common typos and coding errors. Find every style mismatch across your codebase. Open source code so you can extend or improve it for your purposes. SlickEdit is a code editing tool that can boost productivity and improve the quality of your code. It’s a cross-platform code editor that supports more than 60 languages (including C#) on nine platforms. Compiles and debugs your code showing all errors for quick access. Can handle very large files of code, as big as 2 TB. Standard and Pro editions available to accommodate your needs. Rextester (which stands for Regular Expression Tester) is a simple online compiler for C#. 5 seconds of CPU time per each piece of code. 150 MB of memory for each piece of code. Code runs in an appdomain with basic execution, reflection, thread control and web privileges only. C# Pad is a handy REPL tool for C#. It’s simple to use: simply enter your code and click “Go” to evaluate it. Quickly test C# code online. Can be embedded on other websites. Another lightweight code compiler, Jdoodle supports 63 languages (including C#) and allows you to save your programs and share them with others with a URL. You can embed code created in Jdoodle to your website, use it for collaboration, online interviews, and more. Quickly test small pieces of code online without having to open the IDE. Easy to share your code with others. A popular fiddle tool for C#, .NET Fiddle was inspired by JSFiddle.net and meant for quick, simple code testing without the need to open Visual Studio and create a new project. Lets you write, save, and collaborate on C# code. Supports 4 project types: Console, Script, MVC, Nancy. Also supports VB.NET and F#. Telerik Fiddler lets you execute code online. It offers a range of functionality including web debugging, web session manipulation, performance testing, security testing, and more. Runs a series of tests like performance tests, web debugging, and security tests. FiddlerCore lets you embed the Fiddler app into your own application so you can avoid the entire Fiddler UI, and yet get all the functions of Fiddler. Json.NET is a popular JSON framework for .NET. With it, you can create, parse, query and modify JSON, convert between XML and JSON, and more, while running it from anywhere (Windows, Windows Store, Windows Phone, Mono, and Xamarin). Serialize and deserialize .NET objects. Create, parse, query, and modify JSON with JObject, JArray and JValue objects. A simple online editor to write and execute C# code, Scriptcs is designed with simplicity in mind to avoid hindering your productivity with overly complex tools and solutions. Avoids the bloat of a full-blown IDE. Gives you flexibility and speed for simple C# coding tasks. dotPeek lets you decompile .NET assemblies into C#. A free, standalone tool offered by JetBrains, dotPeek is based on ReSharper’s bundled decompiler. Powerful search and navigation features. Decompile any .NET assembly into equivalent C# or IL code. Supports multiple formats (.dll, .exe, .winmd). 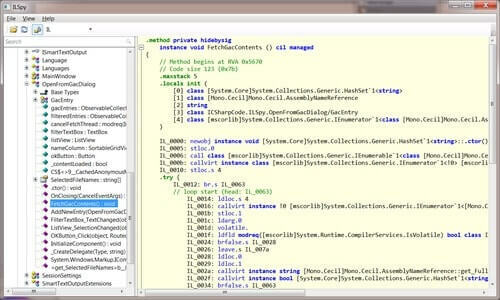 Save decompiled assemblies as Visual Studio projects. An open source decompiler based on Red Gate’s .NET Reflector, which was discontinued in 2011, Ilspy requires .NET Framework 4.0. Browse assemblies and decompile them to C#. Save an assembly as a C# project. Intuitive search and navigation features. Decompilation to VB and C#. A capable decompiler from Telerik, JustDecompile is a free, open-source decompilation engine. Extensible with an open API. Easily switch between methods and assemblies in tabs. Visual Studio extension for decompiling within VS projects. Telerik Code Converter converts VB code to C# and vice versa. A simple, yet powerful tool, Telerik Code Converter is easy to use, with an intuitive, straightforward interface. Cloud-based conversion that’s quick and hassle-free. Uses NRefactory library for complex code conversions. Built with Telerik UI for ASP.NET AJAX. Cake (C# Make) is a C# version of the open source Make build automation tool. A cross-platform build automation system, Cake uses a C# DSL for tasks such as compiling code, running unit tests, copying files and folders, compressing files, and building NuGet packages. Available on Windows, Linux and OS X. Built to behave in the same way as other CI systems. Supports build tools including MSBuild, MSTest, xUnit, NUnit, NuGet, ILMerge, WiX, and SignTool. MSBuild was launched by Microsoft in 2008. It’s not part of the Visual Studio platform, but it’s a good resource for your C# development toolkit for certain use cases, such as when you’re building code projects apart from a solution. Coming from Microsoft, it was widely used by many MS shops. Microsoft has baked it into Visual Studio ensuring it doesn’t get orphaned. Build Win32, x86, x64 or any cpu platforms. Build multiple configurations for multiple platforms. And that's it for the first half of this compilation of the biggest C# tools out there and what they offer. Stay tuned for Part 2, where we'll cover the remaining 22 vendors you should be aware of for your C# needs. Is C Programming Still as Relevant Today as It Once Was?